Larger battery than standard vehicle, largest battery out of the whole Mk3 range. Varta sell OEM equivilants (Varta Silver and Ultra/Stop-Start recommended). 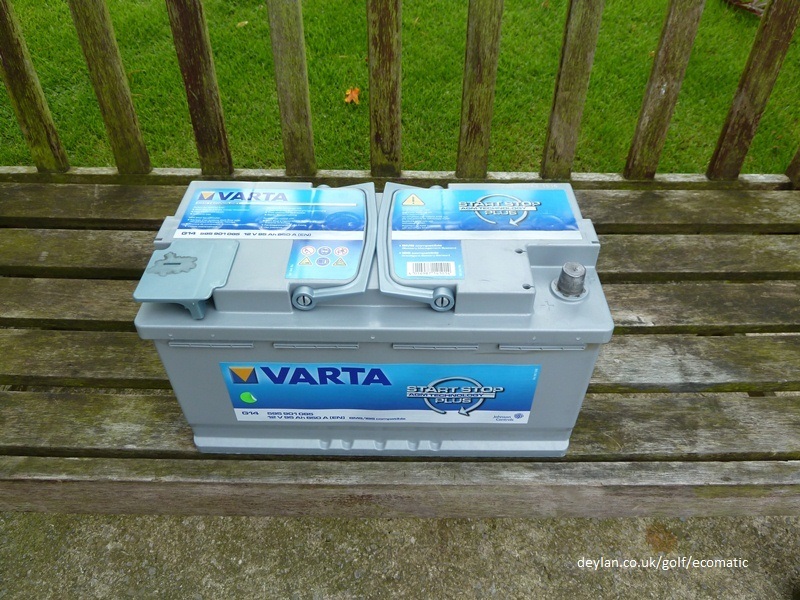 The genuine battery is made by Varta anyway. It is important the Ecomatic is fitted with a large and good quality battery with good CCA (cold cranking amps) rating to ensure the starter motor restarts the engine quickly, and reduce strain on the alternator and electrical consumers, the cost of replacing electronics damaged by voltage fluctuation far exceeds the extra for a good battery, the battery should also be able to take the strain from the large amount of engine starts. A poorly performing battery can result in oddities with the engine restarting procedure, such as, if the engine has been off for a while, a restart can be unsuccessful or take more than one attempt. The Ecomatic can be push started. hope new battery strange brand MAXIS will be good, original is too expensive 155 £ for now. I bought a Genuine VW 000 915 105 AH battery during the summer (bought off eBay new, I'm not made of money!) and it hasn't let me down. Good job I bought it. Gave up trying to start the car after a minute or two - It would have started if I had continued for another minute or so but I didn't want to risk burning the starter motor out. The battery was showing no signs of running out of juice though. it was funny in one store the guy started to argue with me and nothing i said was good for him . People like this really annoy me. If they actually listened to their customers (from time to time), then they may actually learn something. Have fun with your new battery, I am sure it will be fine, have you noticed the starter motor turns faster? I did when I replaced mine, much better!